5.11 Australia offers Australia Regular Post, Express Post and in-store pick up when you purchase from our website. All Shipping costs will be calculated automatically with Australia Post Postage calculator. Certain items only available in regular shipping due to weight and sizes. 5.11 Australia also offers international shipping to New Zealand. Base rate of Australia Post Air Mail for all orders to New Zealand will apply. Some states of New Zealand may incur extra shipping costs. 5.11 Australia usually ships within 4-5 business days for available products. If your product is unavailable at the time of purchase you will be contacted and arrangements will be made. 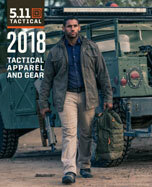 For returns and exchanges please email us at salesau@511tactical.com to obtain a Return Authorisation number. 5.11 Australia does not accept packages without an RA number. If an order is sent to our warehouse without an RA number it will be returned to sender.